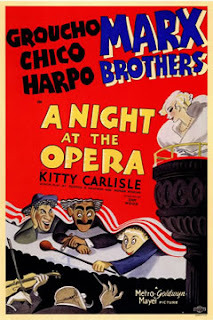 A Night at the Opera is one my 50 Greatest Movies I'll be reviewing at my blog. I do fast-forward through the singing though. Robert: Thanks for stopping by! Your comments are always appreciated. I look forward to reading your take on this film (please be sure to stop back and post a link once it's up). And while I don't forward through the singing myself, I SURE DO want to sometimes! YES, CYNDI LAUPER'S SCENE IN THE MTV AWARD WINNING VIDEO " Girls Just Wanna Have Fun" is very slap shtick similar to In both "Partying in the Rooms" and "Room Service" is delivered in "A Night at the Opera" the door flys open and everyone falls out, in Cyndi's Video their partying in her bedroom and the pizza delivery arrives out flys the door & everyone fell out of the room! Fun Times! But where was the toilet paper streamers !!! Terrence: Thanks for the comment! It's been a while since I've seen that Cyndi Lauper video (I thank you for breaking it down for me...brings the memory rushing back! ), but even back then, I knew it borrowed from this movie!